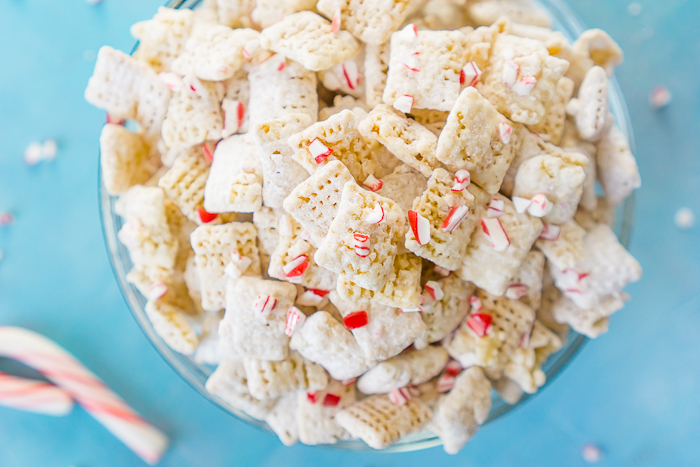 White Chocolate Peppermint Puppy Chow (or Muddy Buddies) combines candy canes and white chocolate for a tasty holiday snack mix that’s perfect for your Christmas parties! It also makes a great holiday gift for your neighbors, coworkers and friends! 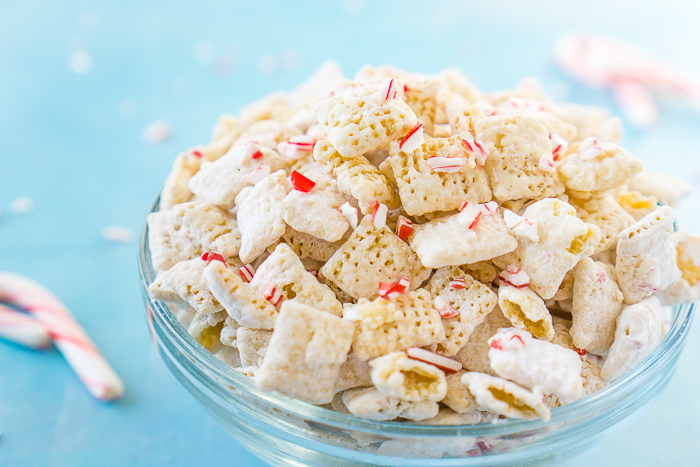 Peppermint Puppy Chow is a Tasty and Festive Holiday Treat! I’ll be honest – I was nervous about making this recipe at first. I always am when tackling mint because creating a sweet mint dessert can sometimes be tricky, with the mint flavors easily becoming a bit overpowered. But I’ve been liking mint more in my dessert recipes as I’ve gotten older and, after successfully pulling off the Mint Oreo Cheesecake and the Mint Chocolate Truffles, I was feeling more confident in tackling this Peppermint Puppy Chow! Boy am I glad I did! This Christmas puppy chow has quickly become one of my all time favorite party mixes. The subtle peppermint balances out perfectly with the white chocolate and I love the additional little crunch from chopped up candy canes. I purposely made the flavors balanced enough that everyone can love this Peppermint Puppy Chow, but you could definitely tweak the ratio between white chocolate and peppermint to make the peppermint flavoring more powerful. It would be an easy adjustment you could make mid-recipe by melting more peppermint baking chips and sprinkling on extra crushed candy cane. Like many of the puppy chow recipes on my site, this one doesn’t include any peanut butter. First, I like to try to eliminate nuts from these recipes as often as I can since it is such a common allergen and one that my niece has. Second, it just didn’t seem to fit! Someone asked me if I included it when I was sharing the recipe with them the other day, but I had a hard time wrapping my brain around peanut butter and peppermint. I’m confident sticking to white chocolate and peppermint was the right choice. WHAT CAN I MELT FOR A “WHITE CHOCOLATE” PUPPY CHOW? Your best choices for melting when it comes to a white based puppy chow recipe is White Chocolate Melting Wafers, Candy Wafers, or Vanilla Almond Bark. The flavors will all be a little different but fairly similar; you wouldn’t be sacrificing anything significant flavor wise, and I find that most people just have a preference one way or another. If you are set on trying white chocolate chips because they are more economical or you’re just desperate, you will want to turn the temperature down low on the microwave and heat at no more than 30 seconds at a time. I find that adding a tiny amount of vegetable oil after melted helps keep the chocolate thinner and smoother for tossing with the Chex Mix. 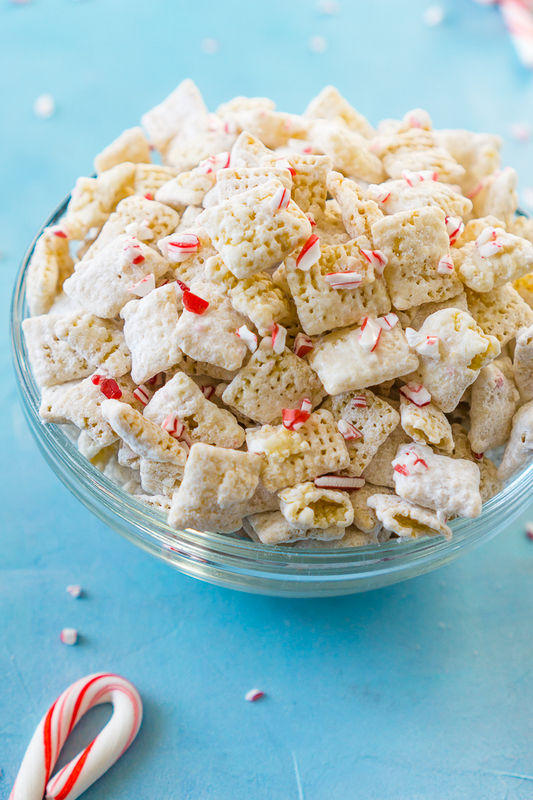 Time to Whip Up a Batch of White Chocolate Peppermint Puppy Chow! In a medium microwavable bowl, microwave white chocolate or vanilla almond bark with the peppermint baking chips in 30 second intervals, stirring in between, until completely melted. Pour over Chex Mix and toss until evenly coated. Add the crushed candy cane and stir. Add powdered sugar to a zip lock bag and add the Chex Mix to the bag. Seal and gently toss and shake until fully covered. Lay out on parchment paper to cool and set. Sprinkle additional crushed candy cane immediately if desired. Note: I specifically made this recipe to have a subtle peppermint flavor that my whole family would enjoy. If you want a stronger flavor, you can adjust the melted chocolate ratio, such as 3/4 cup white chocolate and 2/3 cup peppermint chips. You could also add additional crushed candy cane before the powdered sugar. I’m so obsessed with puppy chow. I make it at least once during the holidays, it’s so addicting! !